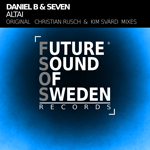 The upcoming producer duo Daniel B and Seven have worked together for several years. Seven is a composer and singer-songwriter who writes melodies and lyrics on a daily basis. Daniel is more your typical passionate producer, with beat programming, loops, fx and sound engineering being key. “Altai” – which is their debut release – is a trance track with a strong synth lead and great atmosphere, fuzzy strings and vocal ad-libs, resulting in a classically styled uplifting piece. Representing unity, ”Altai” – which means “the Golden Mountain” – is named after the mountain range in Eastern Central Asia where Russia, China, Mongolia and Kazakhstan come together. is a progressively building, slightly chilled, laid-back track. Great presence and sound stage, combined with an almost minimal trancey approach gives a very unique atmosphere to the mix. Kim’s version is a techy progressive tune with an amazing build-up ending in an emotional break. The bassline brings to the table something quite different, an aggressive groove with a rough, deep dubstep influence. Altai is now exclusively available on Beatport, and for all other major retailers the release date is set to be December 24th. For the full details if this release incl. previews press here and you’ll be directed to our music archive database. In the database you’ll also be able to download artwork for the actual title and all following releases for the future. Next story Zaitek – Time For Money EP Out On All Major Online Stores & Spotify!